HISS and a ROAR has announced SD005 PRESSURE, a sound design source library focused on sounds generated via air pressure. Props included: a five ton steam engine, spray cans, fire extinguishers an air compressor with many different attachments, truck air brakes, a domestic pressure cooker, balloons, shaken up soda cans, paintball guns & the most essential device of all; the human breath! 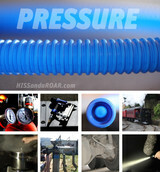 SD005 PRESSURE will be available to purchase on November 23, 2010.